Built in the Mid Century and Only Blocks from the Beach. A Match Made in Style and Relaxation Heaven! It’s not just a home, its a vacation for you, or a great set for your filming production, or a nice location for a photo shoot! I mean check out the Sunken Living Room. The Gnomad Beach Pad was Built in 1964. Old Stan kept great care of the house and we were happy to take it over after his death in 2012. We honored him and his wife by not making a ton of changes. I decorated the entire house with picked and found items. I went with the design theme of Mid Century, because, well, It was built in the Mid Century! So we had to go all the way Mid Century in the Kitchen. Vintage Tupperware for any and all occasion or storage needs! Even Vintage Kitchen Appliances : Ice Crusher – Check, Milk Shaker Blender – Check, Mixer – Check, Juicer – Check, and even an Popcorn Popper – Check! Lovely Bunch of Lovely Vintage Bowls that I slowly collected by picking often and regularly. Now for on top of the super cute Formica counter top! Some of the stuff is just for show, and some for use, but love it all! And yes those are old Cosco Stepping Stools as seating at the very large peninsula counter top! Perfect height, why not? Moving over to the Family room, the Hub of the House! One big giant room with a fireplace on ones side and the sliding glass doors to the patio on the other side. And a big TV, DVD Player and a Stereo for your entertaining pleasures. Hammock AND Bocce Ball. Yes…And So Much More! Easy Breezy Back Patio with curtains that go all the way around for extra privacy. And get this…an Outside Shower with HOT water. The front and side grass covered yards provide enough area for a football game and croquet match to go on a the same time, if not more activities! So much room for so much fun! Let’s go the rooms of rest! The Master Bedroom itself is a retreat! Large, Light, Airy and oh so Comfortable! And then there is the large En Suite Master Bathroom! The Shower Sliding Doors and Toilet Private Swinging Door are to Mid Century Die For! And the Huge Sunken Tub is to Relax in! It is a Mid Century Beachy Mini Spa Room! This is the “No place like Gnome” Guest Room. Relaxing, complete with an adjustable bed, and a desk to write home on! A nice place we like to call the “Mad Men Den” Guest Room. Relaxation up front and Worker Bee Desk on the side. It is as adorable as it looks. Complete with vintage pink hamper and trash bin. I could just live in there. There is half bath too, but I have to leave something for your imagination! That’s the House and here is some nature. Take a look at the cute wood peckers I caught on film in the yard. And here is just a bit of what we have seen nearby The Gnomad Beach Pad! The Falcon Heavy Folks, which you could have seen from the front lawn! So get your feet on over to The Gnomad Beach Pad. And Sink your Feet into the Sand or the Lush Sunken Living Room Carpet. Please feel free to ask any questions in the comments below! And Here is to another “My Gnome Little World” Adventure! Cheers! They Say It Is THE WORLD’S LARGEST YARD SALE! And, Oh Yes We Did! But We Did Check Out Some Ohio Bits. But Stopping Approximately 10 Times a Mile Made That hard! In Around 11 Hours on the Road. That is around 3 Miles an Hour! Hee Hee! Such a Scenic Drive, So Going Slow was Easy! Barns Filled With Love Stuffs for The Hub and I do Go Through! And Cool Old Boots and Bowling Shoes! Without Motors And With Motors Too. I Checked Out This Even Older Whizzer! Awesome Bike…But it Was Not For Sale! Let’s Get to the Items That Were For Sale! Chairs that Need to Be Sat On, Now! And Then Let the Good Times Rolls! 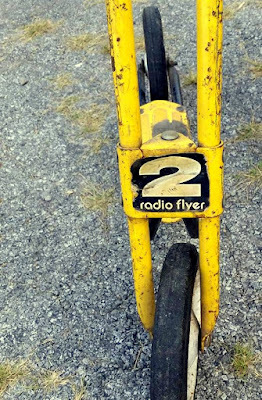 This Radio Flyer Will Get You There! How About These Wheels Too? In A Little Blue Settee! Pull Up a Seat, And Read a Book or Two! Here’s Some of the Fun Stuff We Brought Home with Us to Our Own Big World! Literally, those are Going to Our Mid Century Gnomad Pad for the Christmas Holidays! This Very cool Retro Ceiling Light Will Soon Be Up For Sale on Our Etsy Shop! Yes, I bought All Three. And 1 of of them Will be For Sure Up For Sale Soon! I have a small collection of Hand Made Wire Flexible Vintage Baskets, But None are Shiny. They are all browned or rusty. This One is Very Very Very Interesting! These Cuties will Both Be Up for Sale. The Hub and I Both Had Napkin Holders In Mind! I will End this Blog Post with a Cuteness of a Different Kind! 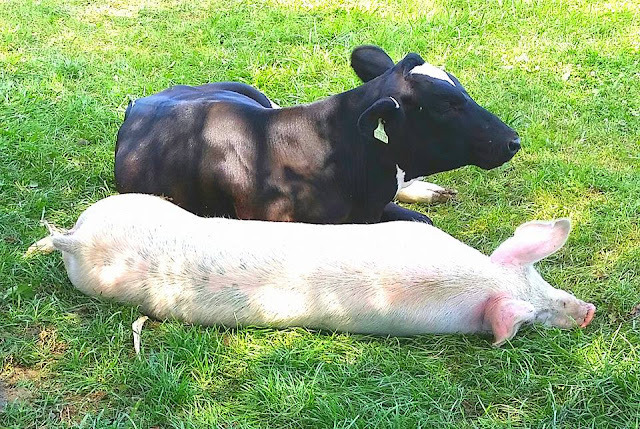 These Two Cute Buddies Were Laying About Together Not Too Far From One Barn Yard Sale. 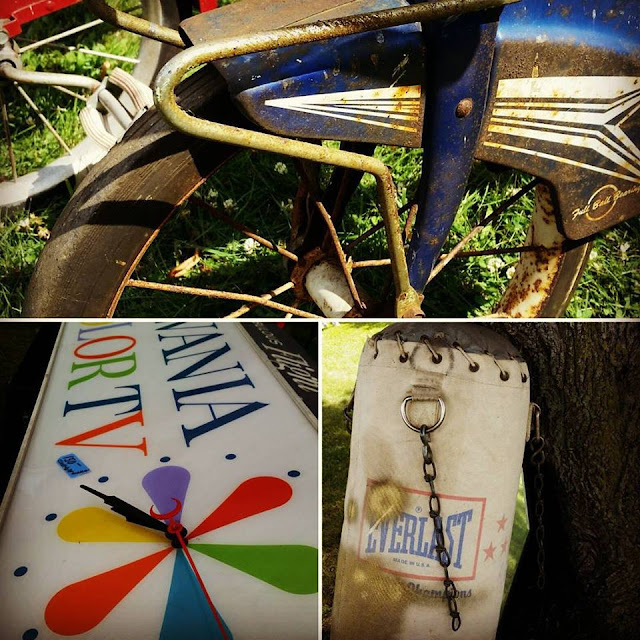 The Scenery, the Weather, the People, the Items and the Junk were All Perfect On our Bit of the World’s Largest Yardsale. They were Two Perfectly Junky Days! Check Into the Esty Shop to See What Else We Found to Sell! OUR OWN BIG WORLD! Come Back Soon to See What We Have Made or Picked Just For You, You and You! HOW WE MAKE A HOUSE A HOME…OVER AND OVER AGAIN. BUT MOST OF ALL IT IS OUR HOME FOR NOW! Is when we move, we move with just a limited amount of stuff. So I pick, thrift, yard sale, flea market, estate sale & auction to make a new place our home. 1) Picked the pallet the The Hub never took apart…so went through scattered pickings and ended up with the idea of the tar sap cups flower pockets! 2) Picked the galvanized gas can which holds the locally made wood Sweet Vidalia Onion! And we are not even inside! 1) Retro Orange Pretzel Tin Can…it travels with us…for now! 2) Got the awesome never been used 1970 hammock at an Estate Sale in Savannah! 1) Got the Porch Swing at the Peaches to Beaches 700 Mile Yard Sale and then painted it! 2) I bought 4 ladder back chairs with very damaged seats and came up with this design for what I love to call my “Porch Lounger”. 3) A 75 Cent Table that I decoupaged and painted! The Front Siting Room, Which Doubles as a Guest Room! 1) Couch was bought at a Savannah Estate Sale. 3) My painted framed photography also travels with us…for now. 4) Most on mantel is for sale, except Gnomes! We do not have an official entry way/foyer, so I had to make one! 1) Coat Rack I made from pallet board and thrift knobs. 2) Thrift store Mid Century Shelf turned Shoe Rack. 3) A Men’s valet for keys and extra coats recently bought at a flea market. 4) Sandal bin is vintage enamel pan recently bought at a yard sale. Two More Views of the Front Sitting Room! Or More like Picking Storage Spots! 1) Vintage suitcase Valet turned side table with painted glass frame turned tray! 2) Picked Very Rustic Wood stool, Thrifted Mid Century Clock & Junk Store found Antique Chimney Screen! To the Left of this Sitting Room is our Bedroom. Okay, it is also a bike, craft, arts and tool supply storage area! 1) Suitcase night stands and stairs for old cat to get into bed are also used for storage. 2) I recently bought the missing drawer dresser on the cheap, repainted and such, and there you have it. 3) Mid Century Shadow Box / Bar Mirror for my pretty up area. 4) Lights over dresser are yard sale found trouble/mechanic lights. 5) Circle Art are Yard sale found Needlepoint hoops with some material scrapes and some material I personally designed! 6) Tool, Arts & Crafts Supply Shelf bought at a Yard Sale. Now Back into the Front Sitting Room! You can go straight through it to get to the Dining area of the very large Kitchen. I’m realizing it is very mid-century in there! 1) Table we brought, but will probably sell before we leave. 2) Tension Pole Light in corner is very much for sale. 3) Shelves on both sides are filled with picked decor pieces, photos, kitchen supplies and a bar supplies. 4) Beloved Step Stool was picked in a junk shop. 5) Art on wall was picked recently and for sale! Through the dinning area is the kitchen! The Kitchen Side of the Huge Room. 1) Yes I have vintage hand strainers as wall decor and canvas carpenter bags as recycle bins! 1) I made a light out of a dog chain, a vintage soda shop glass crate, a colander and an Ikea light fixture. 2) The decor on top of the fridge is part of my picked galvanized metal collection. 3) And counter storage is in vintage tin colanders! The Other Side of the Huge Kitchen is the Laundry Room! 1) Old gas stove burner grates for wall decor! Through the middle of the Large Eat In Kitchen is the Family Room! View from the Door…this is where we spend most of our time at home! View from the side with Wall of Windows. Big Overstuffed Chair The Hub has had for, maybe, 15 or more years! The Rest of the Family Room! 1) Wall Decor Over Couch is a piece of old factory life. It states the days that has gone by without any accidents. The numbers can be changed on the back. Picked this as a gift for The Hub…who is a safety freak. 2) Other Wall Art is My Photography. 3) Cat Throne is vintage blue suitcases, an old moving blanket stuffed into the top one and a vintage piece of chenille bedspread covering to make it pretty! And yes, that is our 18-year-old cat asleep, wheezing, snoring away on it! 4) The desk is an old chrome and Formica table yard sale pick! 5) Round Table picked at a Junk shop. 6) Side table are part of my old wood food box collection! 7) Wood piece in corner is the bottom of a mid-century coffee table! Almost Done Touring The Gnome Shack! And the very stained sink! But this little room holds some of my favorite pieces! 2) To the Right is vintage adult and child’s enamel chamber pots. 3) Under the sink is an antique maple sapping bucket with a recently picked stool and metal box that I have had for maybe 20 years. 4) There are curtains on the wall close to the sink, not because there is a window, but a door. In renovating, I guess they forgot to take the door out! That is the Gnome Shack! It is home for now. But now Home is where The Hub and His 18 Year Old Cat is. Are just ships passing us in the night. If we did not adopt it ourselves! If you can not find an item in the photos that you are interested in buying, please comment below and I will get back to as fast as I can. Our Sunshiny Mid-Century Modern House! There will be some before and after photos, but to get the full view of the before house please go to: HenderBalz Blog: Adventures at Home ! As always if you want to see the full photo album, click on any of the photos! Welcome to the Living Room! From House House Lovely House! We may just leave this oh-so-not mid-century couch in this room as both the room and the couch are big and they fit each other! 94% of everything else in the living and dining rooms is from the Mid-Century! Matter of fact, most of the house is furnished with mid-century items…down to the set of Sears flatware my Mom gave me as a teen probably for my hope chest! You get the point…new paint, furniture and personal touches! Could not pass up the light fixture that Jim rebuilt and the Sears star burst clock that my Step Father fixed! The Above Corner has my Mid-Century Belt Chair and a bunch of drift wood in the corner! The above Corner has our somewhat collection of international stools…two are old, one is from Honduras! We love our new OLD dining room lamp that Jim rebuilt! Oh so cool, airy and grey with a splash of color! No more carpet, stripped wall paper or dressing room lights! And what it used to look like! We want a cool low profile mid-century couch in this room, probably where the table and chairs are…but have not found one we like enough yet! And a similar view from before! And the old Dark Den! Personal Touches in the Den! The guest room / Dawn’s Making Things Room! The Pink Jack & Jill Bath just needed some love and a spit shine! All the cranky 50-year-old bushes were removed and more tropical plants were put in AND the entire outside was painted! Love our new mid-century style shutters and the pop of flower in front! The new Landscaped Corner Island! New side yard “Island” landscaping! And if you ever visit (And you know YOU ALL are invited) the Garage Door Entrance Welcome Area! WE Love our new place and had fun and some fights getting it to this point, but it is not still 100% done! And 10 pieces in these photos, I created! Can you guess which 10? Look forward to finishing it completely! And to buy Mid Century Modern Items for you Home…Visit Our Online Shop! HERE IS A PEAK AT SOME OF THE STUFF GOING INSIDE IT! From More Mid Century Finds! WITHOUT A 3 TIERED SERVING CART! WHAT? YOU NEED TO MAKE A CALL? SIT HERE ON THIS COOL METAL STOOL AND USE THIS EVEN COOLER PHONE AND PHONE BOOK STAND! THE WORLD ON A DREXEL! Vintage Globe sits atop a perfect Kip Stewart’s Declaration Line Drexel End Tables! Kip Stewart Drexel Coffee Table! FELL IN LOVE WITH THIS ONE OF A KIND STAR BURST MIRROR! AND WHO COULD SAY, “NO” TO THESE BEAUTIES? “NOT I!” SAID THE MID CENTURY VINTAGE BUYING FOOL! WE HAVE ONE OF A PAIR OF FUN CIRCLE GLASS TOP OCCASIONAL TABLES! I HAVE AN OCCASION FOR THESE…DO YOU? The above items were bought at Antique Fairs in Acadia and West Palm, Florida, and at an Auction in Sarasota Florida. Everything we buy we get for relatively cheap…the Drexel pieces and the 3 tiered wood cart were a bit higher…but still way under value! We hope to have the house 90% done by Christmas…photos in the new year! Matter of fact…I should be packing right now so we can move our stuff on over! Shhhhh! UPDATE….OH WE BOUGHT SO MUCH THAT WE OPENED OUR OWN ONLINE STORE! Please visit and shop, if you are so inclined at: Our Own Big World! WE ARE MAD FOR MID-CENTURY PIECES! Here are some of our most recent finds. Mind you, most of these photos are taken after I rubbed, shined, & scrubbed! To get’em cheap, you gotta get dirty! Although I love the colors of the material on the stool, I am thinking we just may have to change it! And folks, the pillow is Jim’s pick. That is his favorite color after all! The book rack and snack trays make everything all the better! I am not sure if this is a stool or a table, but how can you not love those curves and swirls? No poker could be had without hip turquoise cocktail glasses and bowls for chips and snacks! And we could use this octagonal beauty for a card game or two! The above has not yet been spit shined, as I have do not own my secret spit shining sauce in that color…yet! Okay, it is not a secret, I will shout it out! I love Howard’s Restor-A-Finish ! Here’s a cutie to look at in the meanwhile! Need some light and a place to put your cocktail while you lay out a flush? Use this handy lamp / triangle table! For those non-card playing party goers, we have this nice conversation area full of lovelies! We prefer wood, but could not pass up these chrome numbers for the price offered! Already shined up, but with some new material, they will soon be everyone’s favorite! And anything looks better next too a black metal magazine rack and a “I dream of Jeanie” table lamp! In love with our new Mid-Century Danish Modern chair…look at those lines on that baby! One of my favorite finds…the lamp shade! Ooh, the chicken scratch of it all just makes me smile. But I had to bring the couple together and now they will live happily ever after! Old kitchen chairs and a vintage doctor stool, with new colors, may make great seating at our low kitchen peninsula! I could not pass this one up for only $2.00! If I do not use it as is, I have a gold-fish scale wall art project in mind for that frame and maybe a couple of smaller pieces from the art! But this little cutie will fit in nicely. My husband is a sap for water / boat scenes! 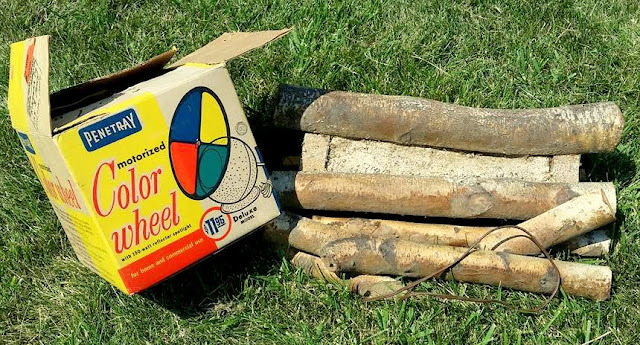 Although we have the nice turquoise ones above, these small handfuls of color will fit nicely in that mid-century bar…uh…when we finally find it! My husband being sensible, found some ceiling light fixtures, that just may fit in! As a gift, I found this beauty for my Jim! No Picasso’s in our finds, but we like them! So…”Where do we find them?” You ask. We found most of these pieces in a great little town in the middle of nowhere, Florida. Arcadia has a cute little downtown that consists of 4 blocks and a million antique stores. Once a month they have an Antique Sidewalk Sale! We found some smalls for great deals on the sidewalks, but hit the mother lode when we walked into the The Opera House! If you are into history, antiques from any era or style, or even ghosts, Arcadia and The Opera House are must see! We will be back for sure! Okay, we need to pick up a bigger piece…but since a full day there did not get us through all the stores, I think more shopping will happen. Some of those pieces are from thrift stores! Thrift stores are my heart and soul! Most antique stores are too dear for my pockets, so I hunt thrifts often. And don’t forget to find the Goodwill Clearance stores! Chairs for $3.00…what the what? Our next adventure is a couple of mid-century auctions! UPDATE: WE BOUGHT SO MUCH WE OPENED AN ONLINE STORE! Please Visit and Shop if you are so inclined at: Our Own Big World! But these days I am spending time to get stuff ready for a new home! I thought I would to strip and refinish some of my old finds…but found something that I is my secret love. From Mid Century Wood Shine! One of two End Tables! One done and one not! On the way to looking good! While I was at it, I worked on this little pretty! Okay, the top is made of Formica, but did refinish the wood legs! Is is bad that I am falling for Formica? This little cutie has a wood pedestal which I shined up to make into a nicey nice! It is happy in our now non-mid-century place! Shining these guys on…so made my happy today! Easy Peasy and such good looks! UPDATE! WE OPENED OUR OWN ONLINE STORE! IN LOVE WITH MID CENTURY MATTER! Although, I have always liked the funkiness or smooth lines of mid century stuff, my usual genre of antique is older, rusty and usually made of metal! But since we started to look at homes to buy in Florida, we realized the one we will buy will most likely be one from the Mid Century. The location we wanted was developed at that time period, so we decided we want to decorate it appropriately! We finally found the perfect untouched beauty for us! So now we are in love with all that is Mid Century Matter! We love a good deal…and will take the time to search for it, most likely at thrift stores, flea markets, antique stores, auctions, yard sales, estate sales and antique fairs! Here are some of our recent finds! Right now these are in my loft area sitting just like this, and I get tickled every time I walk up the stairs! For the Silver Band Chip & Dip, Atomic Star Coffee Decanter & Wood Handle 2 Tiered Dessert Tray I gathered the lowest prices I found on the exact or similar items online (without shipping costs). Every respectable Mid Century Home needs a Sunburst Clock! Similar ones online = $75.00. Our Cost = $16.00 (which I got down from$ 20.00 because I will need to fix it a bit)! Even though we do not have records anymore…we fell in love with this number! Look in other photos, to see the cute little Sunburst on the sides better! Similar ones online = $65.00. Jim has shown interest in a Vintage Travel Bar for quite a while now. So we had to pick up this one, that allowed for the morning after as well. We thought The Executair 720C was a Bar and Coffee Travel Case, but in my research the original piece was mostly just coffee. We happen to like it as is…drinkies for the evening and coffee for the morning after! And for the Bar at Home! The Penguin Hot or Cold Bucket…we like to call it our new Ice Bucket! This particular piece is all over the internet! The lowest price online = $20.00. Could not pass up the bigness (Oh, okay…or the price) of this industrial most likely mid century clock! 1960’s Wharfedale W20D Speakers for Jim’s more modern stereo! And everyone needs a Kromex 2 Tier Dessert Tray! And now comes the Funky Fun Find! Well, I do now and I own 2 pieces…love them! Our Cost = $7.00 (talked down from $10.00)! Now on to my current Fav…Mid Century Lamps! This one is our newest and most expensive addition! It is hard to find the same exact ones I have online, as there are so many cool similar designs though! They varied so much in price, for ones in pairs, ones without shades, and ones outrageously overpriced…so I just took an average online price. Our Cost = $16.50 (1/2 off original antique store price sale)! Okay the following is not a new one, but I had to add it in this post! This is my baby…love her! A spontaneous buy at an auction in Townsend, Vermont! And now our Mad Men ensemble! No ciggies for Jim, but he does enjoy a cigar now and then (uh, outside). Jim bought the 1998 Lammhult Cinema Chair at a tag sale (New England’s way of saying Yard or Garage sale) last year in posh Manchester, VT. The LARGE lamp and end tables are newbies! The chair is not mid century, but it fits in! Current Price new = $1500.00! Recently Sold at Auction = $600.00! Our Price = $5.00 (but I must say the leather has a some damage…can be fixed though)! The lamp was one of my recent finds here in Fort Pierce, FL! We bought this pair of end tables at a Vero Beach Auction! Our Cost = $20.00 (They do need some love). And soon to be ours! Our Cost = $100.00 (plus $35.00 for deliver & thanks for our Realtor for it for us until we really do own the place, but 100.00 off original price because I am buying it on 1/2 Off Monday)! So far we spent =$216.00 (minus the Lammhult Cinema Chair) for what would have at least cost $1174.00 retail! We still have a couch, 2 chairs, 2 coffee tables to go and a lot of light fixtures…not sure if I can stay within our very low-budget as these items are definitely higher priced! Of course, dessert trays, coffee decanters, ice buckets and traveling bars were not originally included in that budget! In hopes of saving some money, I am already making art/decor and 2 hanging lamps for the house! Check my future posts to see how I made them…and if they even came out decent enough to use! Ha, after this recent experience of our Mid Century Hunt, both Jim and I feel I can buy extras as I find them (and maybe make extras), and start my own Mid Century Shopito! UPDATE….WE DID OPEN AN ONLINE STORE! 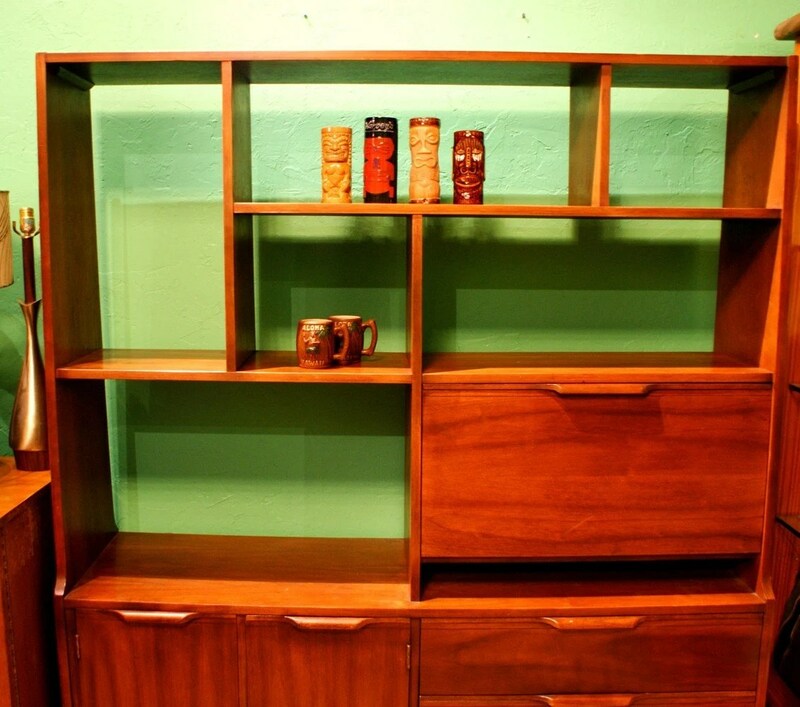 YOU CAN FIND MID-CENTURY MATTER AND SO MUCH MORE AT: Our Own Big World!